Bring the Calgary Philharmonic to your classroom! CPO musicians are available for pre or post education concert visits as well as at other times throughout the school year. Musicians share information about their instruments, play a short performance and answer questions. Appropriate musical experiences can be designed for grades K-12, and can feature solo instruments, duos, trios or quartets. Rates start at $205 an hour for one musician. Geared at grades K-6, The Curmudgeon and The Lark features two of Alberta’s finest woodwind professionals (CPO Principal Flutist Sara Hahn, and CPO Assistant Principal bassoonist Michael Hope) in a program that focuses on storytelling. The centerpiece of the program is “The Curmudgeon and The Lark” a specially commissioned duet by celebrated Alberta composer Arthur Bachmann that tells a story of friendship and transformation between a grouchy old man and an injured bird. All with a captivating narration–and special sound effects produced on the flute and bassoon. Other works on the program feature an interactive version of Mozart’s variations on “Twinkle Twinkle Little Star” and works by Bach and Beethoven. Plus–sing-alongs, instrument demonstrations and lots of fun! Taking their cue from an historical overview, Duo Coro will present repertoire from the Baroque to upbeat contemporary music. Included will be short demos explaining how the horn works and will include a proven popular segment where a number of students/audience members will be invited to “build and play a horn” using just a mouthpiece, piece of tubing and a funnel. The music selections may be customized to include orchestral excerpts featuring the 2 horns to coincide with composers that are on a CPO family or education concert. A variety of horns may be used for this purpose including hunting, descant and regular double horns. Special effects, such as stopping, muting, or advance techniques can also be incorporated depending on the age of the group. Geared at grades K-6 and featuring Christopher Sales and Michael Hope–the bassoon section of the Calgary Philharmonic Orchestra, this program showcases the wildest and craziest instrument of the orchestra. All in a program of insightful, delightful and sophisticated music ranging from Opera to Dave Brubeck and The Simpsons! Let your students find out just how fun strings quartets can be with music ranging from Bach and Beethoven to familiar tunes of today by the Beatles, the Verve, and Coldplay. The program will include introductions to the violin, viola, and cello as well as the music and musicians with a fun, humorous and insightful approach. If appropriate, the concerts will involve students and include a question and answer session. Topics that will be discussed are: musician teamwork, rhythm, sound production, time signatures as well as beat patterns. All presentations can be catered for grades K-12 and beyond. This string quartet program is evidence of the fact that musical excellence and a sense of humour can get along very nicely together. The quartet’s members are all members of the CPO and share a passion for chamber music. 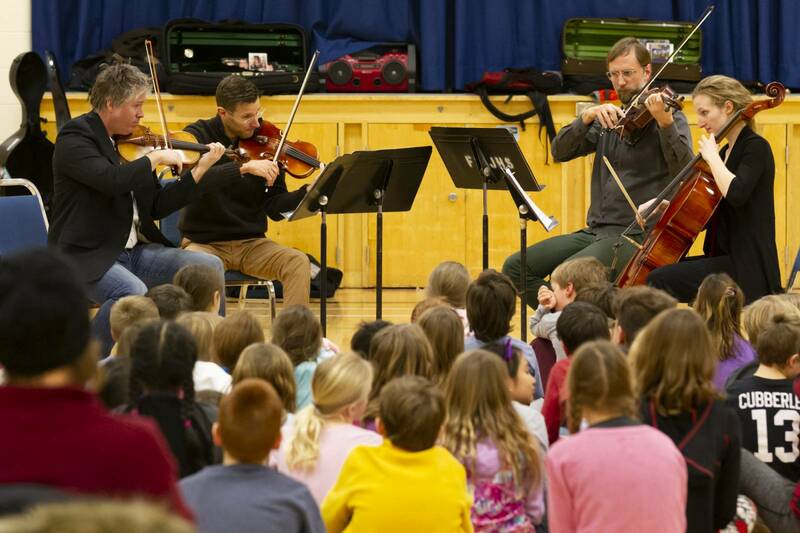 The quartet has been in existence since 1998, having presented many programs in Calgary and in rural Alberta. Zabaglione’s programs aim to present great music well played along with humorous moments well presented. Along the way we’ll talk about how stringed instruments work and how we play them, and share our love for the music we present. The programme is custom tailored to the age group of our audience, and we allow time for questions and answers. For grades 4 and up there’s a quick violin lesson for a lucky member of our audience followed by their debut performance. It’s fun, lively, entertaining and informative.